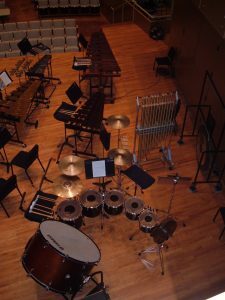 Image of percussion instruments set up at Illinois State University’s Center for Performing Arts. The ISU Percussion Ensemble, under the direction of David Collier and Ben Stiers, will present their spring concert, “Wood and Metal” at 7 p.m. Sunday, April 9, in the Center for the Performing Arts on the campus of Illinois State University. The concert will illuminate the sonic possibilities created by combining a myriad of percussion instruments. The “wooden” portion of the program will open with Knocking on Wood by Tyler Eschendal. Inspired by the works of Steve Reich, the ensemble will present the world premiere of With All Your Might by ISU percussionist Michael Suau. This intriguing work has layers of rhythmic counterpoint as it combines woods and metals. At the center of the concert is Giantess Ella by Carl Schimmel, professor of composition at Illinois State. The work for four percussionists capitalizes on the “wood and metal” theme by using two vibraphones and two marimbas. Giantess Ella is a mallet quartet that uses tessellation of the chromatic scale to weave a sprawling tale of three characters, each of which is represented by a unique musical motive that recurs throughout the work. DisArchitecture by composer Dave Hall combines an array of metallic and wooden instruments in this quartet based loosely on the “deconstructionst” architecture of Frank Gehry. The ISU Percussion Ensemble will conclude with David Maslanka’s Crown of Thorns. This full ensemble is mallet percussion exploring the possibilities of combined pitched wood and metal percussive sounds. Tickets are $10 for general admission, $8 for faculty/staff, and $6 for students and seniors. Tickets can be purchased at the CPA Box office. For further information on the concert, contact David Collier by e-mail at dcollier@ilstu.edu. If you will need a special accommodation, please contact the music office at music@ilstu.edu or call 438-7631.